Lemony Snicket’s A Series of Unfortunate Events is based on a series of popular children’s books that I have not read. Shocking, I know. My knowledge of the Baudelaire siblings comes exclusively from from this film. Based on the movie, I might be interested in picking up the novels. I definitely get the sense that there was a lot left out in this adaptation. Lemony Snicket is a dark, gothic comedy for kids. The basic plot is that the three Baudelaire siblings are sent to live with various distant relations after their parents’ mysterious deaths. All the while they are pursued by the evil Count Olaf (Jim Carrey), who will stop at nothing to get the children’s inheritance. The story takes its cues from Roald Dahl classics, as the young protagonists befall one misfortune after another and must save themselves as the adults surrounding them are generally inept and/or oblivious. I rather enjoyed the movie because of the Dahl-like story, which is accompanied by visuals that could be straight out of a Tim Burton film. The result is a perfectly gloomy world, set in a nondescript time period. It underscores the peril the Baudelaire’s constantly face, but is not too scary as to alienate the target audience. The cast is also excellent. The three children– Violet (Emily Browning), Klaus (Liam Aiken), and Sunny (Kara and Shelby Hoffman)– perform well and hold their own against the more seasoned actors, like Meryl Streep and Billy Connolly. However, Jim Carrey consistently steals the show as the dastardly Count Olaf. This role suits Carrey’s over the top acting and ability to morph into wacky characters. He’s fun to watch, especially when interacting with the young cast. The only thing that seems to be missing is… well, I don’t really know. Not having read the books I’m unsure what elements are lost in translation. Lemony Snicket apparently incorporates elements from the first three books, so maybe too much is packed into this single movie. This was also meant to be a multi picture franchise, meaning the ending is left open for future installments. But with no sequel in sight (the kids are obviously too old now), the ending left me disappointed. For me, it’s unfortunate that Lemony Snicket’s A Series of Unfortunate Events wasn’t given a sequel or two. I appreciated that the story doesn’t shy away from the darker elements in life just because the intended audience is children. The adventure is fun, and the young characters are intelligent and inventive. I could have watched more. Reboot, anyone? This film is just missing something for me. It has all the makings of a cool young adult romp, but it really did leave me wanting more, despite a solid cast and an over the top performance from Jim Carrey. Lemony Snicket’s A Series of Unfortunate Events is the story of Violet (Emily Browning), Klaus (Liam Aiken) and Sonny Baudelaire (Kara and Shelby Hoffman). 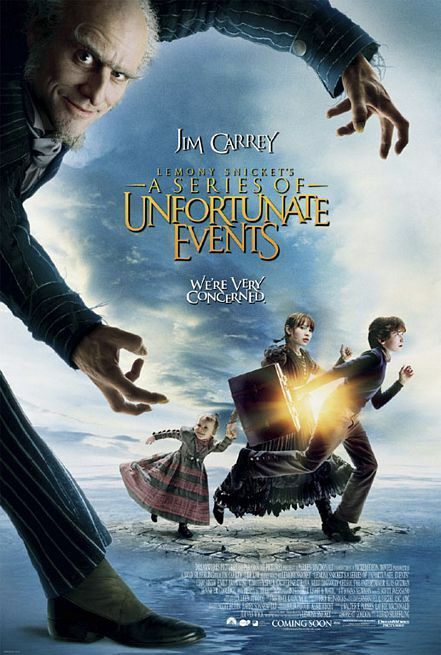 When their parents are mysteriously killed in a fire, they are sent to live with the dastardly Count Olaf (Carrey), a wannabe actor with designs on murdering the three young orphans so he can inherit their parents’ fortune. The children have to stay one step ahead of the mean count as they hope to thwart his plans. Along the way, they are also sent to live with an animal loving uncle (Billy Connolly) and a hypochondriac grammar Nazi (Meryl Streep), but are always finding their way back into Olaf’s clutches. I think my biggest problem with this film is that it was quite depressing. This makes no sense, because plenty of my favourite films have been set in a dystopian future and are quite melancholy. This film was made at a time when Carrey really needed a hit, and unfortunately this was not it. Carrey was coming off an extended time of box office flops, dating back to the ordinary Cable Guy. Outside of his success in dramatic work like The Truman Show and Man on the Moon, Carrey had not had a bonafide hit since the late 90s, and badly needed this film to be one. I am not sure what is missing here though, Carrey tries his best and is remarkably rubber faced, just as he always is. There is just something missing from this film that prevents it from being a fun movie. Maybe that’s what is missing, the fun! Now I can watch The Hunger Games movies even though they are set in a depressing time of poverty and rebellion, because there is still fun to be had here. There is no fun to be had from this film outside of a few Carrey faces. If I want that, I’ll just watch Dumb and Dumber. The subject matter is quite dark. Dead parents and orphans are not what I would usually want to see in a film. The three kids leave a little to be desired too. I never really care about them. This is mostly because Carrey is such a commanding presence, he eats up any sort of concern I had for these three kids with his over the top performance. Connolly and Streep are a lot of fun as the kids aunt and uncle though. Streep particularly seems to be enjoying herself as the children’s scatterbrained aunt. Lemony Snicket’s A Series of Unfortunate Events wastes a solid cast by removing the fun element that needs to be there when a movie has this kind of depressing subject matter.